NVIDIA's Next Generation Tegra is the world's first processor for the mobile web. LAS VEGAS, NV--(Marketwire - January 7, 2010) - 2010 INTERNATIONAL CONSUMER ELECTRONICS SHOW (South Hall 4 - Booth #35912) -- NVIDIA today launched its Next Generation Tegra, the world's first processor for the mobile web, specifically designed for the high-resolution needs of tablets. Consumers have been waiting for a truly portable, high-resolution, no-compromise Internet experience. NVIDIA's new Tegra processor delivers that by combining lightning-quick browsing, streaming 1080p video and Adobe® Flash® Player 10.1 acceleration with an immersive 3D user interface and days of battery life. "Without question, 2010 is going to be year of the tablet," said Tim Bajarin, President, Creative Strategies, Inc. "The new NVIDIA Tegra processor has a unique feature set critical for tablets -- fast web browsing with fully rendered pages, uncompromised graphics, snappy user interface and HD video -- all with the battery life we've only seen with cell phones." Next Generation Tegra is now in production. Developers can order the Tegra Developer Kit to create applications for Tegra-powered devices such as tablets, smartbooks and smartphones at developer.nvidia.com/tegra. At CES 2010, NVIDIA is hosting many revolutionary new tablets that leverage the power of the next generation Tegra. Visit NVIDIA's booth in South Hall 4 #35912 to see the latest designs. "Consumers can now get the tablet experience they've always dreamed of and they can leave the power cord at home. Only NVIDIA Tegra can make this happen. We're driving tomorrow's tablets today." "We are pleased with the quality of Flash based videos, games and other rich Web based content that we see with NVIDIA's Tegra mobile processor. Mobile devices like tablets, smartbooks, and smartphones are now able to play smooth, HD content delivering hours of stutter-free video without draining your battery." "ASUS' newest tablet designs are packed with innovation, demanding sophisticated graphics processing capabilities, quick touchscreen UI performance, with very low power consumption for long battery life. The next generation NVIDIA Tegra processor has been chosen because it measures up to the stringent design requirements of our products. These products will continue to embody the innovation and forward thinking that ASUS is known for." "NVIDIA has been a great partner over the years and with Tegra they're bringing their brand of graphics features and performance to next generation mobile devices. We're very excited to partner with NVIDIA to demonstrate Unreal Engine 3 on Tegra here at CES." "We are very excited by what NVIDIA is doing for mobile gaming. Tegra will open a whole new set of mobile devices for our awesome 3D technology." 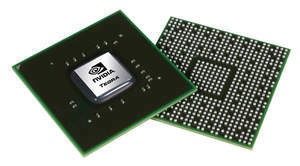 Certain statements in this press release including, but not limited to, statements as to: the benefits, features, impact, performance and capabilities of the next generation NVIDIA Tegra processor; are forward-looking statements that are subject to risks and uncertainties that could cause results to be materially different than expectations. Important factors that could cause actual results to differ materially include: development of more efficient or faster technology; design, manufacturing or software defects; the impact of technological development and competition; changes in consumer preferences and demands; customer adoption of different standards or our competitor's products; changes in industry standards and interfaces; unexpected loss of performance of our products or technologies when integrated into systems as well as other factors detailed from time to time in the reports NVIDIA files with the Securities and Exchange Commission including its Form 10-Q for the fiscal period ended October 25, 2009. Copies of reports filed with the SEC are posted on our website and are available from NVIDIA without charge. These forward-looking statements are not guarantees of future performance and speak only as of the date hereof, and, except as required by law, NVIDIA disclaims any obligation to update these forward-looking statements to reflect future events or circumstances. © 2010 NVIDIA Corporation. All rights reserved. NVIDIA, the NVIDIA logo and Tegra are trademarks or registered trademarks of NVIDIA Corporation in the U.S. and other countries. Other company and product names may be trademarks of the respective companies with which they are associated. Features, pricing, availability, and specifications are subject to change without notice.